Anyone would be as terrified as this man at the sight of a tree-man with a pumpkin head. 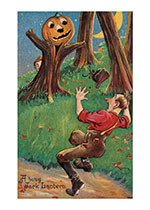 Anyone would be as terrified as this man at the sight of a tree-man with a pumpkin head. The boys playing the trick are highly gratified at the success of their invention.